The Museum’s Lunar Module LM-2 represents a dilemma, at least for the current generation of Smithsonian curators and conservators. What stages of its history are most important, and how should it to be presented to the public? At the time LM-2 was transferred to the Smithsonian, it was the only “real” Lunar Module scheduled to become surplus and therefore available for historic preservation and public display. LM-2 was never actually flown in space, but it had a particularly complex history, having undergone several modifications in the years since its fabrication in late 1966. The conversations between Smithsonian staff, NASA, and the Grumman Aerospace Company (its manufacturer) on how to configure the artifact once at the Smithsonian were never recorded. It was left to future curatorial and conservation staff within the National Air and Space Museum to conduct research and historical documentation on its previous configurations and to develop procedures to ensure the preservation of original materials from all of its various roles. The Lunar Module was the last major component of the Apollo Moon landing program to be designed, developed, and tested by NASA during the 1960s. In its final configuration, the Apollo Lunar Module (LM) was a two-stage vehicle designed to ferry two astronauts from lunar orbit to the lunar surface and back. The upper ascent stage consisted of a pressurized crew compartment with navigation, communications, and control equipment as well as an ascent rocket engine. The lower descent stage had the landing gear, the descent rocket engine, and lunar surface experiments. At the end of 1966, LM-1 and LM-2, the first two Lunar Modules produced by the Grumman Aerospace Company at their facility in Bethpage, Long Island, were nearly complete. They were intended for test flights in Earth orbit. Prior to delivery to NASA, however, the requirements and criteria for certifying spacecraft as safe for astronauts were significantly altered as a result of the tragic January 1967 Apollo 1 fire. Additional fireproofing and enhancements were devised to prevent a repeat disaster. Rather than reconfiguring the nearly completed modules, NASA planners decided to limit them to unmanned Earth orbital missions. LM-1 was to be remotely deployed and tested. If that mission was unsuccessful, then LM-2 would repeat the test. In January 1968, LM-1 was launched as part of the Apollo 5 test mission. LM-1 made five orbits of Earth while technicians remotely tested components of the Lander’s systems before purposely directing it toward a fiery reentry and complete destruction in the atmosphere. Deemed a partial success, and with the “end of the decade” deadline looming, the need for a second unmanned test was questioned. Soon the delivery of LM-2 to the launch facility was delayed and then canceled. Although the second lunar module was denied an actual flight in space, NASA put the spacecraft to good use. In April 1968, the unmanned Apollo 6 launch revealed a disturbing tendency for the Saturn V rocket to vibrate violently in an up and down direction (the so-called pogo effect). NASA engineers at Houston chose to assemble a testing system on the ground to carefully reevaluate the structural stability of the rocket and spacecraft under such stress conditions. In May, LM-2 was assigned for use as part of that test system. Following that, LM-2 was assigned to a drop-testing program to make sure that the electronic and mechanical systems could withstand any jarring that might occur during lunar touchdown. The fifth and final drop test of LM-2 was made on May 7, 1969, less than three months before Neil Armstrong and Buzz Aldrin walked on the Moon. As early as September of 1969 the Smithsonian contacted NASA to lay the groundwork for the transfer of LM-2, once its testing career was completed. 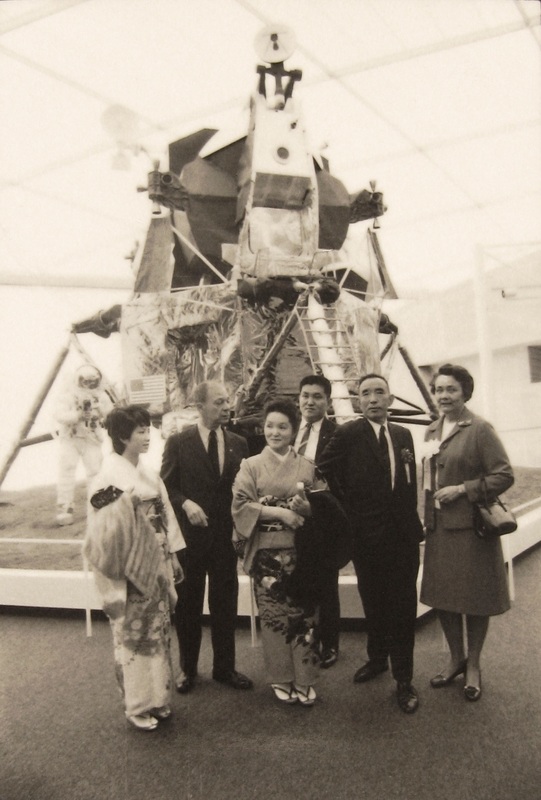 However, the United States Information Agency (USIA) had already made plans to display a lunar module at the 1970 World’s Fair in Osaka, Japan from March 15 to September 13. At least part of LM-2 was to be displayed in Expo ’70, themed “Progress and Harmony for Mankind.” U.S. officials wanted to make sure that “real” Apollo artifacts were available in the United States pavilion. LM-5, Eagle, which was the Lunar Module that took Neil Armstrong and Buzz Aldrin to the Moon, was of course, unavailable. Its lower “descent stage” remained on the lunar Sea of Tranquility and its upper crew compartment had crashed into the lunar surface days after delivering Armstrong and Aldrin back to the Command Module Columbia. Grumman engineers were called upon to reconfigure available components to represent the spacecraft on the lunar surface. LM-2 was the only “real” Lunar Module available. Accordingly, the ascent stage of LM-2 was combined with a test article descent stage (LTA-8) and made to look very much like a lunar module on the surface of the Moon. Following the World’s Fair, the upper portion of LM-2 was reunited with its descent stage and transported to Smithsonian’s Arts and Industries Building on the National Mall in Washington, DC. The LM-2 on display in the two-story rotunda of the Smithsonian’s Arts and Industries Building. When the new National Air and Spce Building was completed on the National Mall, it was apparently never questioned that Smithsonian visitors would continue to appreciate the artifact as a representation of the actual Lander that took astronauts Neil Armstrong and Buzz Aldrin to the Moon. In 1976, Grumman technicians were thus motivated to configure the module’s exterior with as many flight-type blankets and covers as were available from the factory, regardless of whether they had been required during its specific mission-defined activity. Recently, the LM-2 was disassembled, relocated, and reassembled in a prominent position within the new Boeing Milestones of Flight Hall. As part of this move, LM-2 has undergone an extraordinary, detailed process of documentation, preservation, and refurbishment. The project team decided to maintain the look of the Eagle on the lunar surface. But this time, no effort was spared to replicate LM-5 in virtually every detail. When material needed to be removed and replaced (either because it had deteriorated or because we determined it was installed at a later time and without due care) it was carefully photographed, documented, and retained for future research. While LM-2 may look like the Eagle, labels and educational materials have always attempted to relate both the unique history of this specific object as well as the historic accomplishment it was configured to represent. “One small step…” are words that have come to epitomize the ultimate human milestone. Although it was from the LM-5 that those steps were taken, the LM-2 represents its own unique milestone for the Museum.